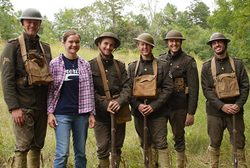 For recent Liberty University graduate Becky Barker, it wasn’t enough to trudge through World War I trenches deep in the pages of history books — she was so captivated by the stories that she brought them to life on film in the forests surrounding Lynchburg. Barker's work made her a decorated history scholar, including a 2017 Gilder Lehrman History Scholar Award recipient. 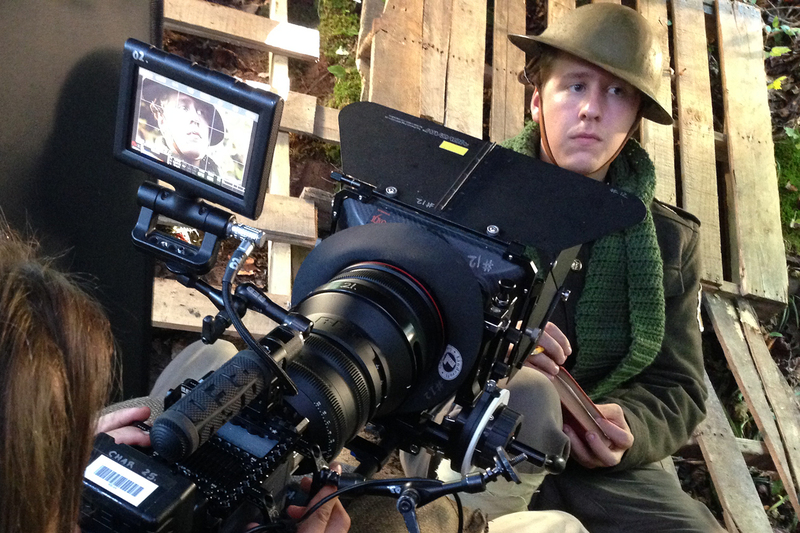 For recent Liberty University graduate Becky Barker, it wasn’t enough to trudge through World War I trenches deep in the pages of history books — she was so captivated by the stories that she brought them to life on film in the forests surrounding Lynchburg. As a student in Liberty’s Department of History, Barker took advantage of the university’s cross-disciplinary program and added a minor in cinematic arts. When she discovered that she loved filmmaking, she added a cinematic arts major, and that’s when she embarked on a project to bring the First World War to life. 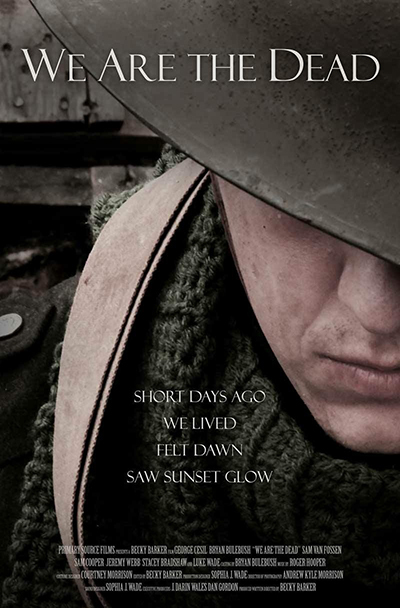 Her short film, “We are the Dead,” focuses on a young soldier who must overcome fear before his first battlefield attack and an almost certain death. Barker’s dedication to uncovering history’s forgotten stories led to multiple accolades. She was awarded Liberty’s History Student of the Year in April 2016. The following semester, Barker was given the Zaki Gordon Award for Excellence in Screenwriting for “We Are the Dead,” her thesis film. Barker is also member of Phi Alpha Theta, the national history honor society, and presented research at a number of conferences. To cap off her education, Barker was selected as one of this year’s Gilder Lehrman History Scholar Award recipients, a prestigious honor given to 15-16 college juniors or seniors from across the country who demonstrate academic excellence in American history. In addition to staple attractions like Times Square, the Empire State Building, Central Park, Rockefeller Center, Wall Street, Yankee Stadium, and the Brooklyn Bridge, Barker was given a VIP historical experience. She visited the American Museum of Natural History and the New York Historical Society Museum, heard lectures from leading scholars of American history, and viewed historic artifacts from the Gilder Lehrman Collection, including the original handwritten letter from Confederate General Robert E. Lee to Union General Ulysses S. Grant asking for a ceasefire so he could surrender, an original print of Paul Revere’s drawing of the Boston Massacre, a lock of President James Madison’s hair, and an original handwritten copy of the Thirteenth Amendment as well as a print of the Emancipation Proclamation, both signed by Abraham Lincoln. Now that she has graduated, Barker is entering “We are the Dead” in film festivals. She also has completed a feature-length script about the Lafayette Escadrille, a group of American pilots who flew for France during WWI before the United States formally entered the war. (Her history capstone project also focused on the Lafayette Escadrille.) Barker plans to pursue a career as a screenwriter, writing adaptations of historically based stories. Historical documentary filmmaking is now offered as concentration under the B.S. in History. Learn more about Liberty’s cinematic arts and history programs on their respective web pages. Liberty University, founded in 1971, is the largest private, nonprofit university in the nation, the largest university in Virginia, and the largest Christian university in the world. Located near the Blue Ridge Mountains on more than 7,000 acres in Lynchburg, Va., Liberty offers more than 550 unique programs of study from the associate to the doctoral level. More than 250 programs are offered online. Liberty’s mission is to train Champions for Christ with the values, knowledge, and skills essential for impacting tomorrow’s world. 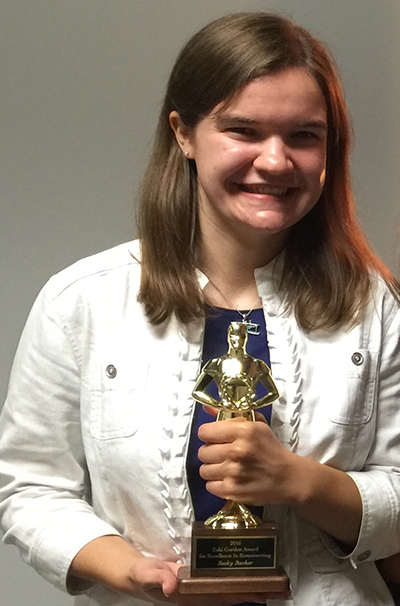 Becky Barker received Liberty University's 2016 Zaki Gordon Award for Excellence in Screenwriting.